It was centered around the theme of 'waste' and involved wearing green and donating 50p towards some new compost caddies and a school wormery. We discussed our aim to reduce our overall waste in school and launched the 'plastic free breaktime' campaign where we hope children will start bringing in snacks at breaktime without plastic packaging. We also looked at local crisp packet recycling and how to reduce the waste of milk at home (millions of gallons are wasted each year). 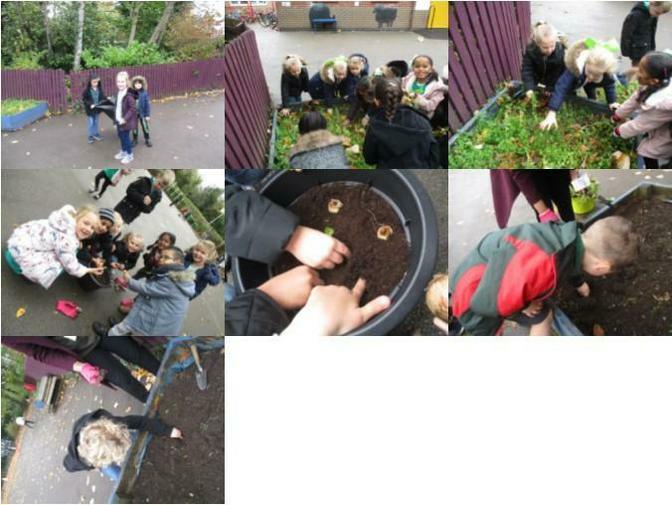 October Green Day - the evidence in action - thank you for your donated bulbs! We had a Green Day on Tuesday 30th October 2018. We did lots more fun activities in school including planting bulbs and a litter pick. We asked children to wear green and donate 50p or bulbs for planting (tulips, crocus or daffodils etc.). Lots of activities in school including a litter pick and use of the outdoors for learning. As a Green Flag School (for the third time!) each term we organise a Green Day with a specific focus e.g. saving water. Polar Bear Day coming Summer 2018! Members needed - we are always in need of staff, parent or governor members so if you would like to join please come and speak to Mrs Rudkin or Mrs Johnstone. The Wildlife Trusts Use this site to learn about your local wildlife trust and what is happening in your area, as well as conservation projects which are taking place. Activity Village Lots of activities to make, print or do. Please note that many of these links are to external websites. Where possible, we have tried to ensure that all of the links are correct but we cannot be held responsible for the content of these external websites.